In the very first days of a baby’s life, the newborn, still struggling between birth and its entry into our world, already needs words. By “needing words,” Szejer means that infants need to be talked to about the specific situations into which they are born. They need to hear about their mothers, fathers, siblings, and caretakers, but they also need to hear about problematic aspects of their histories, such as the death of a twin sibling or the death of a baby before them. These words must be spoken to the baby in the presence of his or her mother and father if at all possible. Such speech helps everyone-newborn and parents-to find their places in the altered world created by the birth. When such words are not present, physical symptoms and illness may emerge. Talking to Babies is the first book to show how the “talking cure” can help infants and their parents. Post-partum depression in mothers, failure-to-thrive in babies-these problems might be approached quite differently if maternity wards incorporated some of Szejer’s practices. High-tech interventions are all too common in American maternity wards; Talking to Babies offers a more humane route for restoring health. “Sometimes, as I am leaving the hospital late at night, I stop to look in on a patient who has recently given birth. And often, as I open the door, I catch a special moment: the new mother leaning over the crib, or more often face to face with the newborn on her lap, looking intently at him and murmuring motherly words . . . In a maternity ward, however, everything is not always so rosy. Birth is sometimes accompanied by suffering, a suffering too rarely perceived in our Western societies . . . When I met Myriam Szejer, an unknown field opened to me: the reality of the newborn’s preverbal behavior. 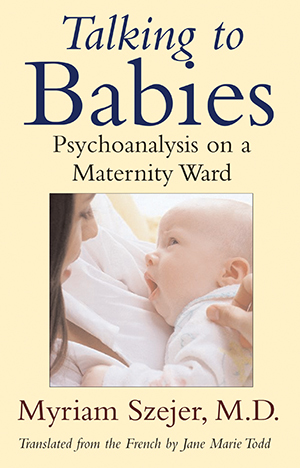 Szejer dares psychoanalyze newborns, dares talk to them, dares intervene before the symptom has taken root, particularly in dangerous situations . . . Her approach ought to become known to all who make perinatal medicine their career. Her approach is innovative. What woman has not been shaken to her very being by becoming a mother; what man has not trembled at becoming a father? Babies feel that profound apprehensiveness. They need to be listened to, which is a form of respect.” -from the Preface by Ren‚àöv† Frydman, M.D.